Nelle Harper Lee was born on April 28, 1926, in Monroeville, Alabama  where she grew up as the youngest of four children of Frances Cunningham (Finch) and Amasa Coleman Lee. Her parents chose her middle name, Harper, to honor pediatrician Dr. William W. Harper, of Selma, Alabama, who saved the life of her sister Louise. Her first name, Nelle, was her grandmother's name spelled backwards and the name she used; Harper Lee being primarily her pen name. Lee's mother was a homemaker; her father, a former newspaper editor, and proprietor, practiced law and served in the Alabama State Legislature from 1926 to 1938. Before A.C. Lee became a title lawyer, he once defended two black men accused of murdering a white storekeeper. Both clients, a father, and son, were hanged. Lee had three siblings: Alice Finch Lee (1911–2014), Louise Lee Conner (1916–2009), and Edwin Lee (1920–1951). ^ "President Bush Honors Medal of Freedom Recipients" (Press release). The White House. November 5, 2007. ^ Langer, Emily (February 19, 2016). "Harper Lee, elusive author of 'To Kill a Mockingbird,' is dead at 89". The Washington Post. ISSN 0190-8286. Retrieved February 19, 2016. ^ a b c d e f Nocera, Joe (July 24, 2015). "The Harper Lee 'Go Set A Watchman' Fraud". The New York Times. Retrieved December 15, 2015. ^ Oldenburg, Ann (February 3, 2015). "New Harper Lee novel on the way!". USA Today. Retrieved February 3, 2015. ^ Grimes, William (February 19, 2016). "Harper Lee, Author of 'To Kill a Mockingbird,' Dies at 89". New York Times. Retrieved February 19, 2016. ^ a b c d Anderson, Nancy G. (March 19, 2007). "Nelle Harper Lee". The Encyclopedia of Alabama. Auburn University at Montgomery. Retrieved November 3, 2010. ^ Mills, Marja (2014). The Mockingbird Next Door: Life with Harper Lee. Penguin. p. 181. ISBN 9780698163836. ^ a b c Kovaleski, Serge (March 11, 2015). "Harper Lee's Condition Debated by Friends, Fans and Now State of Alabama". New York Times. New York. Retrieved March 12, 2015. ^ a b c Shields, Charles J. (2006). Mockingbird: A Portrait of Harper Lee. Henry Holt and Co. Retrieved February 19, 2016. ^ Newquist, Roy, ed. (1964). Counterpoint. Chicago: Rand McNally. ISBN 1-111-80499-0. ^ "Harper Lee". NNDB.com. Retrieved May 7, 2007. ^ a b c d e f g h i Mahler, Jonathan (July 12, 2015). "The Invisible Hand Behind Harper Lee's 'To Kill A Mockingbird'". The New York Times. Retrieved December 15, 2015. ^ Maslin, Janet (June 8, 2006). "A Biography of Harper Lee, Author of 'To Kill a Mockingbird'". The New York Times. Retrieved November 30, 2014. ^ "1960, To Kill a Mockingbird". PBS. Retrieved November 30, 2014. ^ Nance, William (1970). The Worlds of Truman Capote. New York: Stein & Day. p. 223. ^ a b "A writer's story: The mockingbird mystery". The Independent. June 4, 2006. Retrieved August 3, 2008. ^ a b Bellafante, Ginia (January 30, 2006). "Harper Lee, Gregarious for a Day". The New York Times. Retrieved August 3, 2008. ^ Lacher, Irene (May 21, 2005). "Harper Lee raises her low profile for a friend". LA Times. Retrieved March 3, 2017. ^ "26 to Be Advisory Board for National Endowment". The New York Times. January 28, 1966. Retrieved November 30, 2014. In a parallel development to- day, the President appointed Harper Lee, author of the Pulitzer Prize-winning "To Kill a Mockingbird." and Richard Diebenkorn, artist, to the National Council on the Arts. ^ "Newspapers: Spoofing the Despots". Time. January 21, 1966. Retrieved April 29, 2011. ^ Monroe County Heritage Museums (1999). Monroeville: The Search for Harper Lee's Maycomb. Charleston, SC: Arcadia Publishing. p. 21. ISBN 978-0-7385-0204-5. Retrieved June 15, 2015. ^ Kemp, Kathy (November 10, 2010). "In search of Harper Lee". AL.com. ^ Reynolds, Jennifer (February 11, 2015). "Meeting 'Mockingbird' author Harper Lee". Delaware County Daily Times. Archived from the original on March 9, 2015. Retrieved March 5, 2015. ^ Nelson, Valerie J. (August 19, 2012). "Veronique Peck dies at 80; Gregory Peck's widow was L.A. philanthropist". Los Angeles Times. Retrieved September 2, 2012. ^ Lacher, Irene (May 21, 2005). "Harper Lee raises her low profile for a friend". Los Angeles Times. ^ "Commencement 2006". Notre Dame Magazine. Retrieved November 30, 2014. ^ "Harper Lee Writes Rare Item for O Magazine". The Washington Post. Associated Press. June 26, 2006. ^ Paraphrase of a well-known American saying: "Better to remain silent and be thought a fool, than to speak and remove all doubt." The origin of the saying is uncertain; see Quote Investigator, 17 May 2010. ^ "Author has her say". The Boston Globe. August 21, 2007. ^ Martin, Virginia (November 5, 2007). 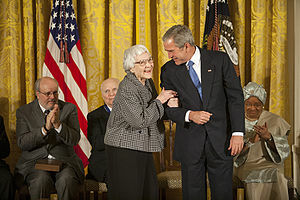 "Harper Lee given Presidential Medal of Freedom". The Birmingham News. ^ "Author Lee receives top US honour". BBC News. November 6, 2007. ^ "Harper Lee". National Endowment for the Arts. Retrieved February 4, 2015. ^ Toohey, Paul (July 31, 2011). "Miss Nelle in Monroeville". The Daily Telegraph. Sydney, NSW, Australia. Retrieved August 8, 2011. ^ Jeffrey, Don; Van Voris, Bob (May 3, 2013). "Harper Lee Sues Agent Over 'Mockingbird' Royalties". Bloomberg. ^ "'Mockingbird' author Lee sues over copyright in NY". AP. Retrieved May 4, 2013. ^ "'To Kill a Mockingbird' author Lee sues her agent over copyright". Reuters. May 4, 2013. ^ Matthews, Cara (September 6, 2013). "Harper Lee settles 'To Kill a Mockingbird' suit". USA Today. ^ "Harper Lee settles legal action against Alabama museum". BBC News. February 20, 2014. ^ Gates, Verna Gates (November 2, 2013). "Town dependent on fame of Harper Lee book stung by museum lawsuit". Monroeville, Alabama. Reuters. ^ Lewis, Paul (November 1, 2013). "Lawsuit divides town which inspired classic novel To Kill a Mockingbird". The Guardian. ^ Carter, Tonja B. (July 12, 2015). "How I Found the Harper Lee Manuscript". The Wall Street Journal. ^ Flood, Alison (July 13, 2015). "Harper Lee may have written a third novel, lawyer suggests". The Guardian. ^ "Recently Discovered Novel From Harper Lee, Author of To Kill a Mockingbird". Archived from the original on February 3, 2015. ^ Alison Flood (February 5, 2015). "Harper Lee's 'lost' novel was intended to complete a trilogy, says agent". The Guardian. ^ Collins, Keith; Sonnad, Nikhil (July 14, 2015). "See where 'Go Set A Watchman' overlaps with 'To Kill A Mockingbird' word for word". Quartz. Retrieved December 15, 2015. ^ "Recently Discovered Novel from Harper Lee, Author of To Kill a Mockingbird". HarperCollins Publishers. February 3, 2015. Archived from the original on February 3, 2015. ^ "Second Harper Lee Novel to Be Published in July". ABC News. Retrieved February 3, 2015. ^ a b Kakutani, Michiko (July 10, 2015). "Review: Harper Lee's 'Go Set a Watchman' Gives Atticus Finch a Dark Side" – via NYTimes.com. ^ "Review rejects claims author Harper Lee was coerced into publishing second book 'Go Set A Watchman'". Radio Australia. April 4, 2015. Retrieved December 15, 2015. ^ Tucker, Neely (February 16, 2015). "To shill a mockingbird: How a manuscript's discovery became Harper Lee's 'new' novel". Washington Post. Retrieved July 18, 2015. Lee, in a statement released by Carter, said she was "happy as hell" that it was finally being published. The statement also quoted Lee as saying that she recently showed the manuscript to some unnamed friends, who verified its merit, thus convincing her to reverse her long-held decision about not publishing. In the statement, she said that she was young when she wrote it, so when an editor told her to reshape it, "I did as I was told." ^ a b c Mills, Marja (July 20, 2015). "The Harper Lee I Knew". The Washington Post. Retrieved December 15, 2015. ^ a b c d e Maloney, Jennifer (July 17, 2015). "What Would Gregory Peck Think Of 'Go Set A Watchman'? His Son Weights In". The Wall Street Journal. Retrieved December 15, 2015. ^ Mills, Marja. "The Mockingbird Next Door". Retrieved December 15, 2015. ^ "Harper Lee, 'To Kill a Mockingbird' author, dead at 89". CNN. February 19, 2016. ^ "Harper Lee dead at age of 89: 'To Kill a Mockingbird Author' passes away". AL.com. February 19, 2016. Retrieved February 19, 2016. ^ "US author Harper Lee dies aged 89". BBC News. February 19, 2016. Retrieved February 19, 2016. ^ "Harper Lee: loved ones hold private funeral without pomp or fanfare". The Guardian. February 21, 2016. Retrieved March 26, 2016. ^ "Harper Lee: Private funeral service held in author's Alabama hometown". ABC News. February 21, 2016. Retrieved March 26, 2016. ^ "Scandalous Me: The Jacqueline Susann Story". The New York Times. 1998. Wikimedia Commons has media related to Harper Lee.